Discount wedding bands needn't mean boring wedding rings. With a little creative thought beautiful and interesting wedding rings can be found that are low cost and look great. One of the best ways to find discount wedding bands is to keep a look out for sales and offers in jewelry stores. While wedding bands are not subject to the same seasonal fluctuations as other products, they can still be found discounted when a jeweler is looking to release space for new items. While wedding rings are traditionally made from gold, other metals such as silver offer a low cost alternative. 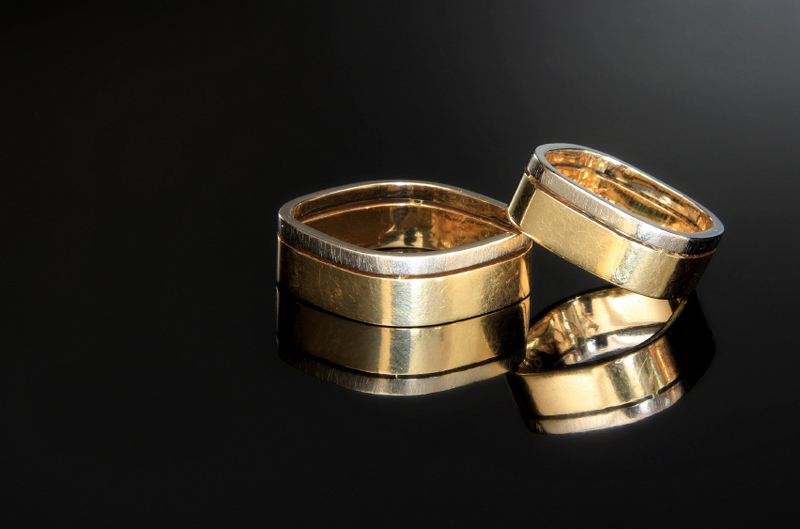 If silver or white metals are not your thing, keep a look out for gold plated wedding bands. These can make an excellent compromise and can be changed for a solid gold ring when your budget allows. Wedding rings are often comparatively more expensive than dress or costume rings. Some styles will make a good substitute for a wedding ring and are available for a much lower cost. Many jewelers are happy to take commissions and create wedding bands for a couple. Plain wedding bands are relatively simple to make and therefore buying a custom band can be a low cost option. Many small or artisan jewelers do not have the overheads of larger companies and can often offer surprisingly good prices. If you are lucky enough to have heirloom jewelry then this can make a great alternative to discount wedding bands. A family ring holds extra special significance and will be much appreciated by all concerned. Used wedding rings often represent good value for money. Jewelers who specialize in secondhand jewelry often clean and repair jewelry and sell it so it looks as good as new. Although used wedding bands may have a few scratches or signs of wear and tear, the low cost easily makes up for this. Wedding bands are often sold as scrap gold yet they may well have years of life left in them or require just a simple repair. Scrap gold is much cheaper to buy as you are just buying the weight of the gold, without there being any value on the ring itself. While a scrap wedding ring may be knocked out of shape, be cracked or severely worn, this can often be repaired cheaply by a jeweler. Ask a local jeweler for more information and keep a look out on online auction websites for scrap gold deals (but do be sure to check the seller's feedback). Sometimes, even the cheapest of discount wedding bands are too expensive or just not suitable. In this case, why not consider something completely different? A cheap and fun ring like one of these costs just a few dollars and can be replaced when budgets allow.